Although its a good few hours ride from my part of Norfolk to R J Hirst in Woodhall Spa I had been looking forward to visiting Lincolnshire again having not been for a while. The rain on the way began to get a bit depressing but then gave way to sunshine and as the clouds parted my depression lifted! 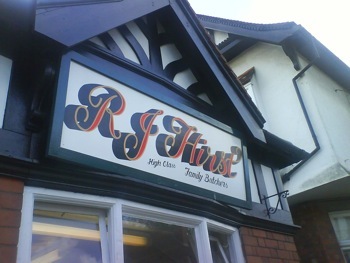 R J Hirst are an incredible butcher’s shop. Russell and Sadie are very welcoming and friendly people. 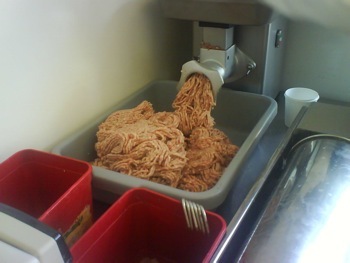 They know everyone who comes in by name and it was truly amazing to see Russell at work making sausages. It is clearly hard work running a village butchers but Russell is one of the most enthusiastic people I have ever met. He accepts that sometimes you have to work long hours to achieve a good product and if you taste his sausages you will know that the effort is worth it! Russell uses a combination of three secret recipes. He makes his sausages as they might have been made 20 or 30 years ago (when he first started making them) and they really do taste incredible. They contain no preservatives or artificial ingredients and although this means Russell has to make them every day it means they taste really good. Russell and Sadie’s gem of a butchers is in a small shop (they are on the look out for a bigger premises) but the quality of everything they do sets them aside from many other butchers. I had about an hour to talk to Russell, Sadie and Kenny and I think every single customer in that time (they are a busy busy shop) bought sausages. One lady bought 70! Luckily for me they had cooked up some of their mouth watering sausages for me to sample and I have to say that if all the sausages in Lincolnshire are half as good as theirs I may be moving. While I was there a photographer came from the Target and a reporter/photographer came from Horncastle News to talk to Russell and Sadie and I. I also did a phone interview with Radio Lincolnshire for their lunchtime news bulletin which I followed up with another interview later. After lunchtime a photographer came from the magazine Lincolnshire Life to take some pictures for a feature on the butchers shop and my visit. After leaving Woodhall Spa I went to Lincoln and pre-recorded an interview with Lincs FM for their farming programme. 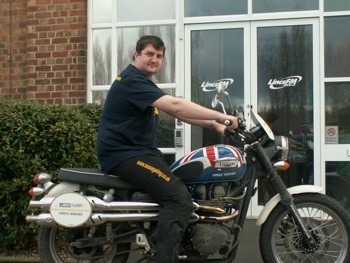 On the way home I stopped to do a further interview with Radio Lincolnshire which turned out to be a bit strange! 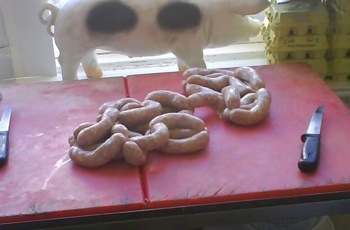 They had a “test” of my knowledge ready which involved veggie sausages, german sausages and the dates of the 2006 British sausage week! R J Hirst are, I think, unique in what they do. Russell’s passion would be hard for anyone else to match and their sausages really are first rate. 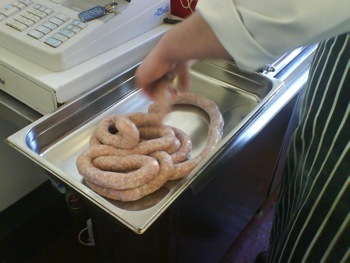 You can see when you try their sausages why they’ve just won the Tastes of Lincolnshire Award and Best Retailer and Producer in 2007. I look forward to returning to see them again when I get chance.